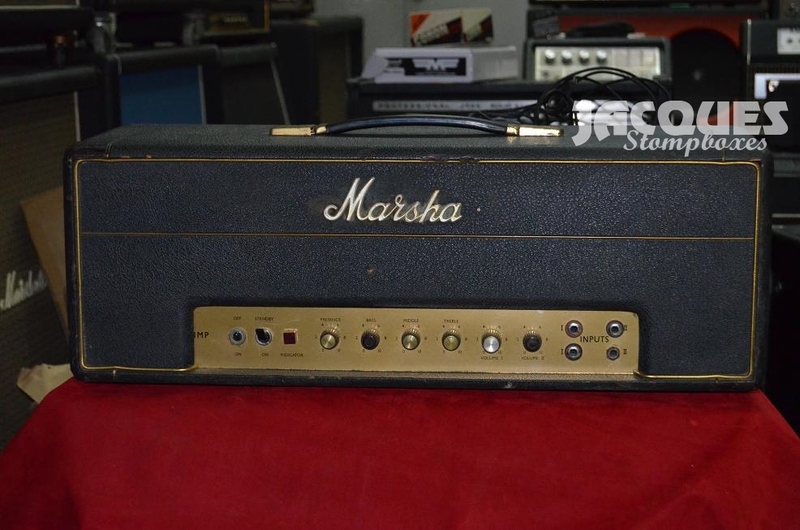 Among vintage guitar amps, Marshall is of course the 1st or second name you will hear and it’s for good reasons : those amps forged Rock’n’roll and I really cannot imagine music without them. 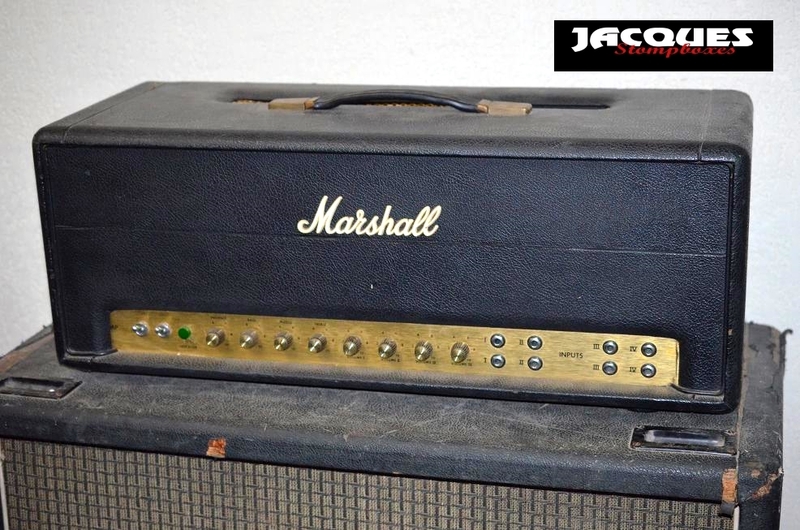 Most guitar heroes have used or still used a Marshall and their music and tones are closely linked to the signature sound of these wonderful amplifiers. 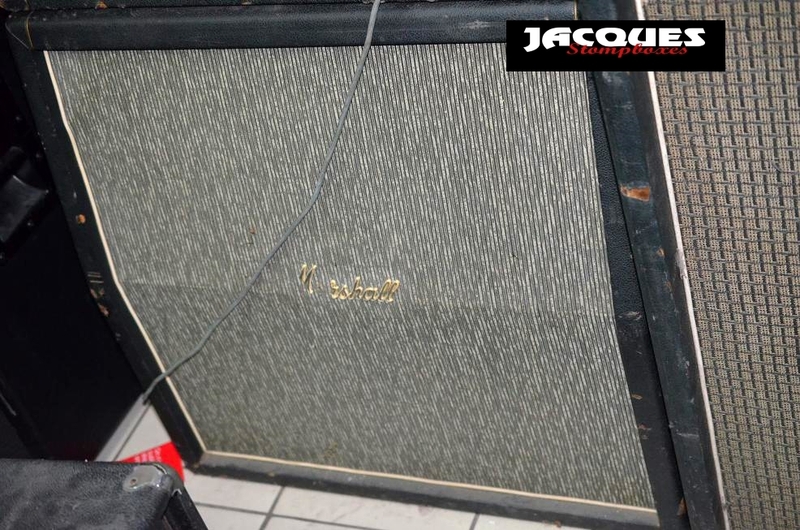 So I propose here a trip though the vintage Marshall of my collection, the Blues Breaker having its own page. 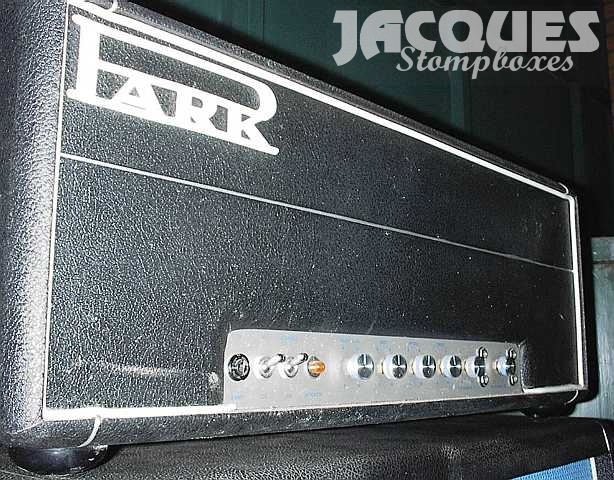 What would be a better start that the amp that started the whole business ? I will not come with more history about the creation of this legend, but instead will try to give a short description of its tone : beautiful clear at low volume and a really unique smooth with lovely high-end when pushed. This, of course, if you use original G.E.C. KT66 tubes. 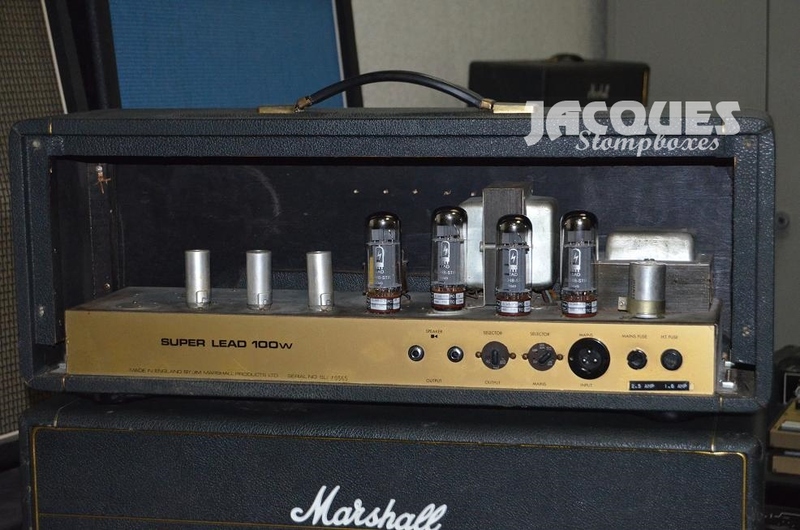 Other 6L6 won’t give this amplifier its genuine signature tone. Note both plexi front plates, golden in front and white on the back, folded aluminium chassis and round three prongs AC plug. 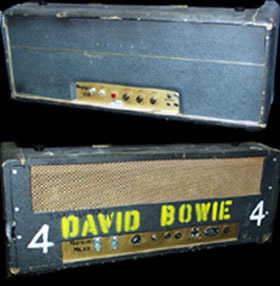 Shortly after the creation of the JTM45, a strong demand of higher power amps raised in the UK, as the British bands played in bigger venues and needed to be loud. 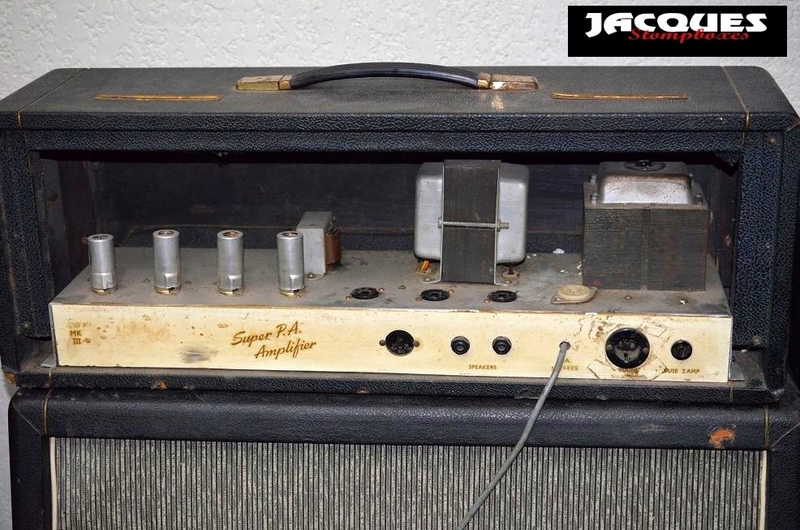 This particular amp may have been created for P.A. 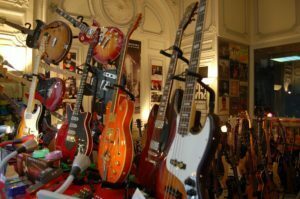 but I am sure many guitarists used it. 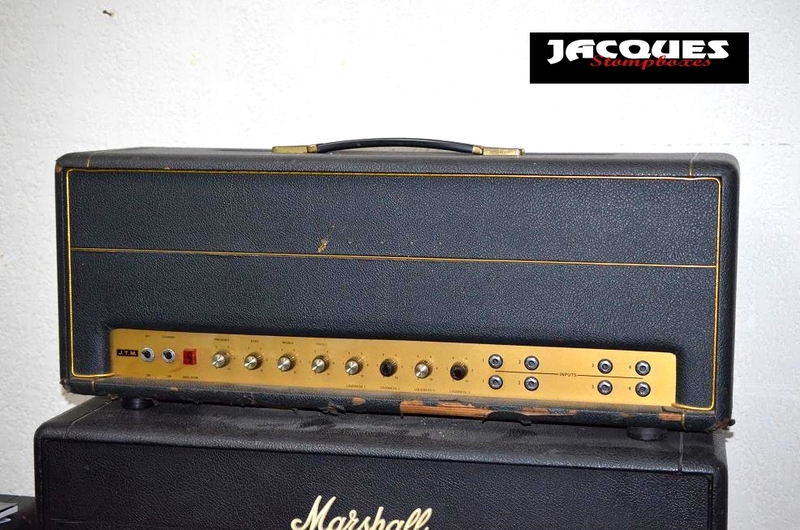 Very rare amp, which can be considered as the missing link between the JTM45 and the later famous 100w plexi. Spot the very ‘Voxy’ copper vents on top and unusual power transformer. 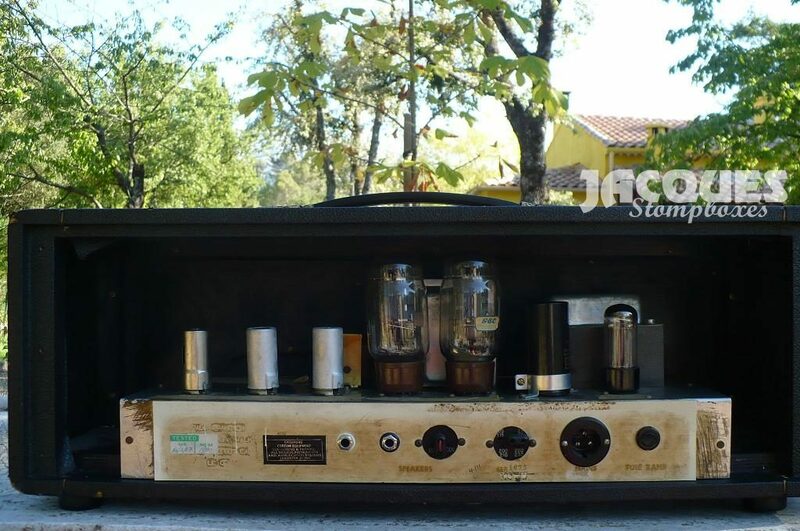 A very rare and mostly interesting amp, as for a long time only mine could be searched on Google. As the audience increased, the guitar players wanted more power – remember in the ’60s , guitar did not come though P.A. – so why not make a 200w amp ? This clever idea had some drawbacks : MIGHTY and fragile power and output transformers -on my pig, we had to change the power transformer- and the use of KT88…. when it was quite simpler and maybe less expensive to get two 100 watters. This explains the short life of the wonderful pig , life in which it had the time of recording the legendary tone of Mick Ronson, and the later great number of amps on stage. 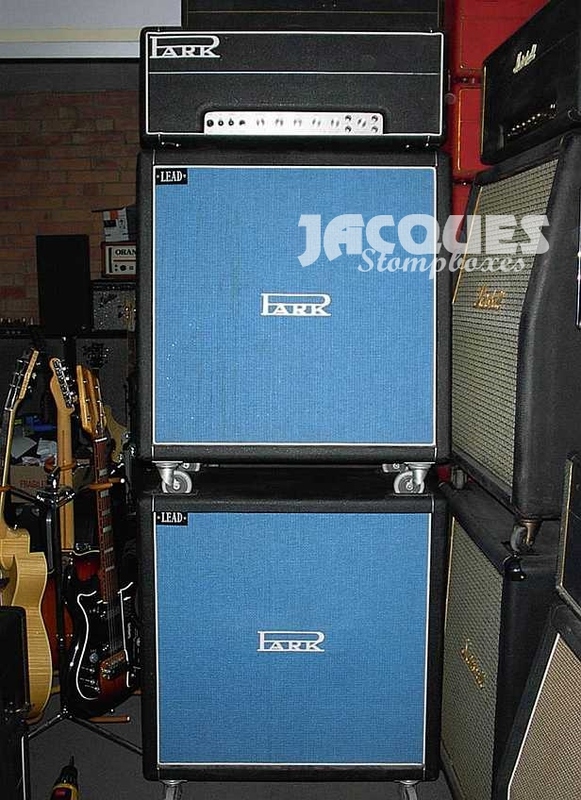 All these amps needed cabs of course, and the most famous is the 1960A or 1960B. The beautiful original pinestripe grillcloth of the sixties is now a rare sight. 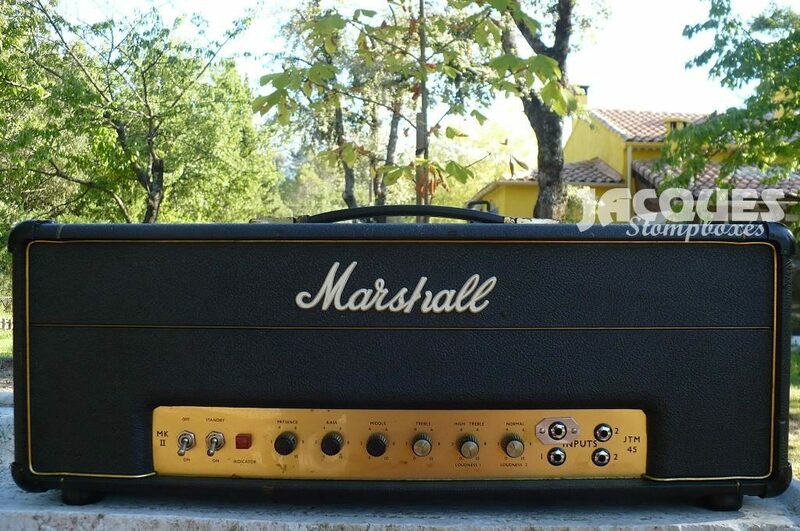 The succesor to JTM45 differs from its ancestor from few things : a stronger and more convenient stell chassis and the use of the tube that will become standard in all Marshall amps : the EL34 . You can find great EL34 tubes these days, thanks to the reactivation of once-lost vaccum tubes factoried. 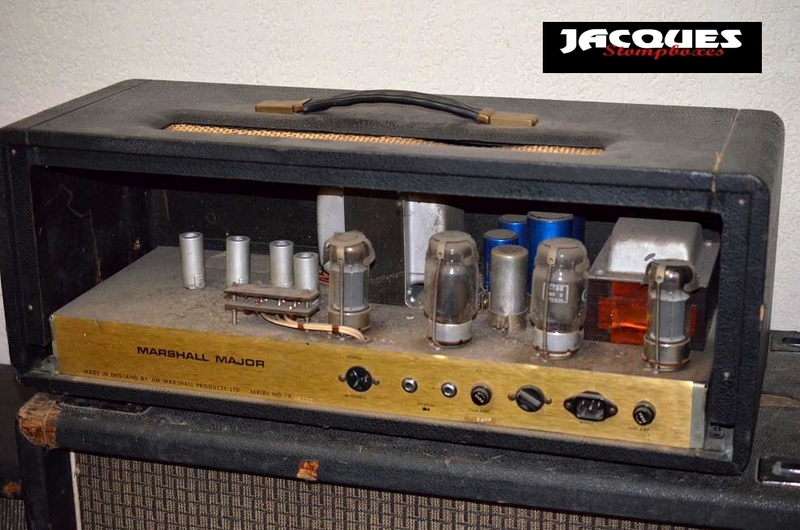 But nothing will replace the perfect distortion of the original Mullard when pushed to their far, far limit. 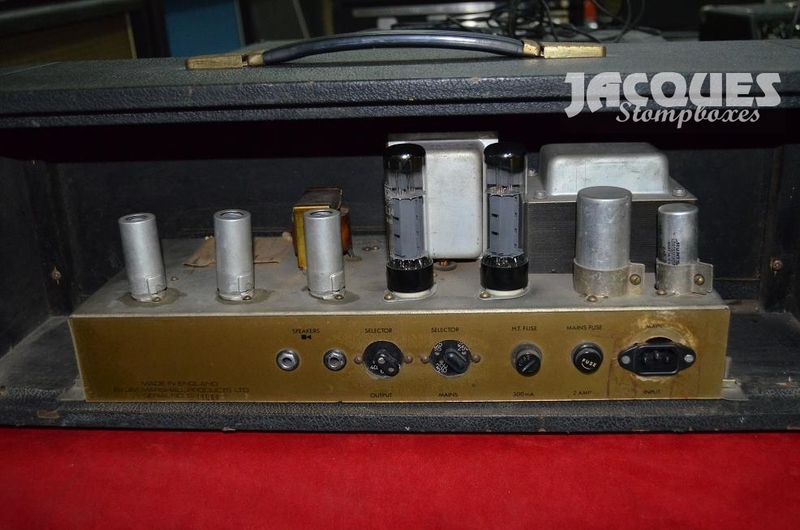 This amp is anyway close to perfection unless you need of course its Majesty …. 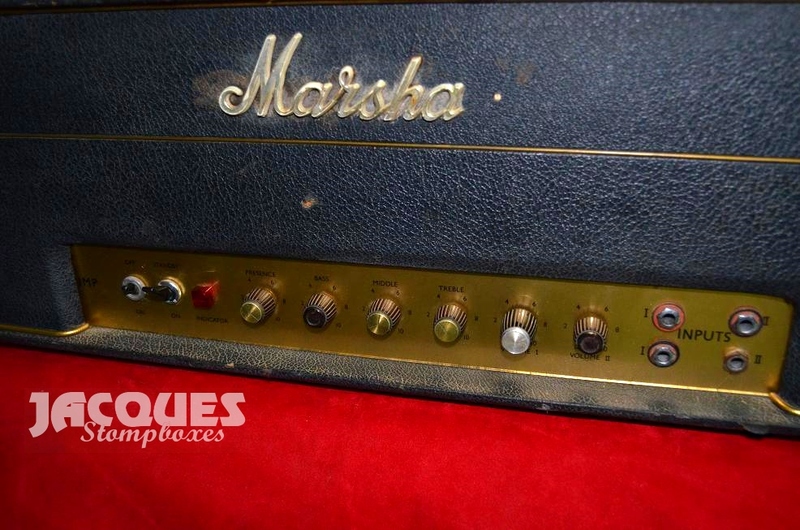 By ‘plexi’ I mean Marshall Super Lead 100w plexi front, the king of all amps, used by the most famous guitar heroes of all time. You will often hear you don’t know what is electric guitar until you plug into one of these vintage monsters at full volume, and this is really not far from truth. The power tubes distortion of this amp is perfect : all of a sudden the raw power in your face turns into a nearly mellow distortion so pleasing you won’t stop playing. Tinnitus-friendly for sure. Here again , genuine distortion tone is obtained with vintage Mullard, newer tubes giving a less smooth overdrive, while this could be subtle if you correctly bias your amp and get a perfect quartet of EL34 as it was done here. 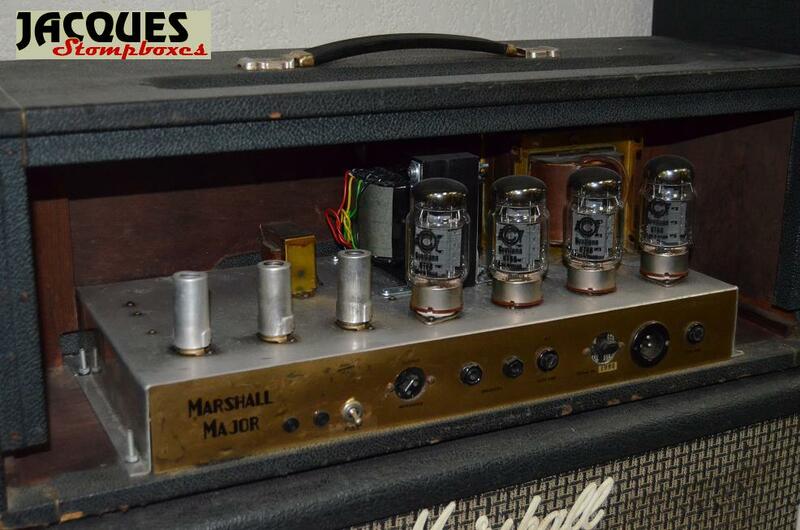 Park amps were Marshall when Marshall could not use its brand for legal reasons. They had different but becoming cosmetics and supposed to be a tad better. 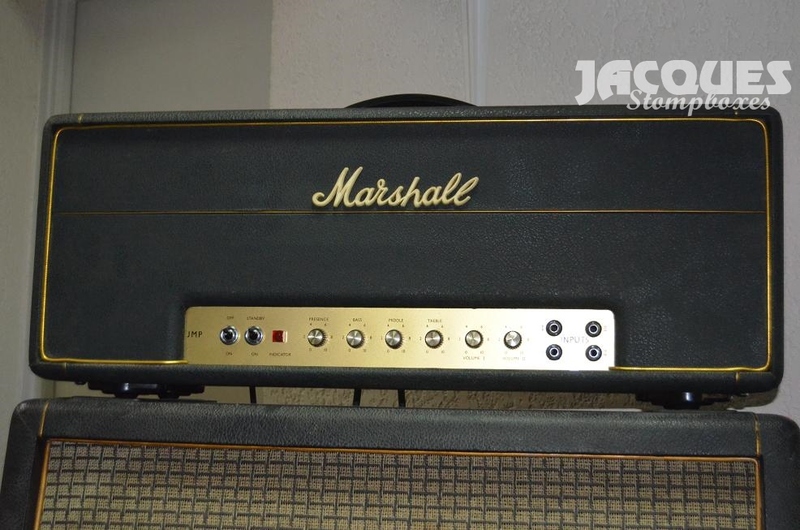 Most Park had the same Marshall equivalent and mine was simply a JMP 100w. 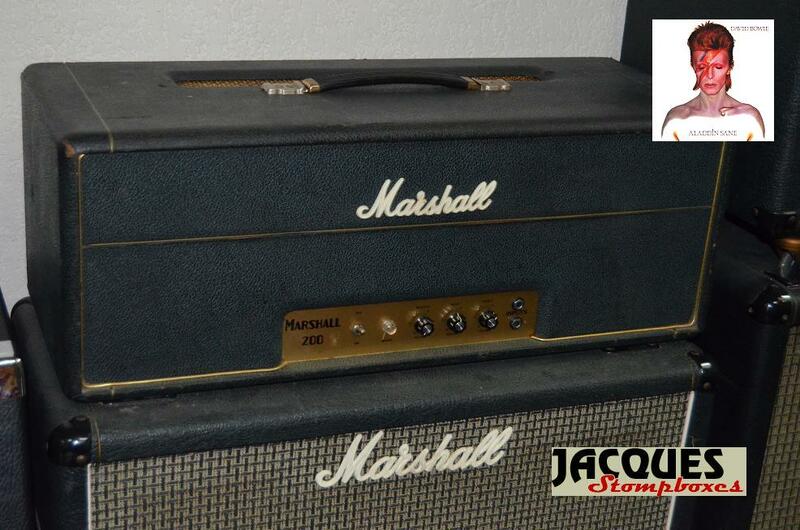 I say was because because this particular amp of my collection went to another famous collection : Joe Banamassa’s. You can actually spot it in numerous video thanks to its flashing blue colour. This 100w P.A. have a rare and short-lived ‘flag’ JTM logo and is a direct sibbling of my JTM100 P.A. on this page. A real beautiful design with its large front face. 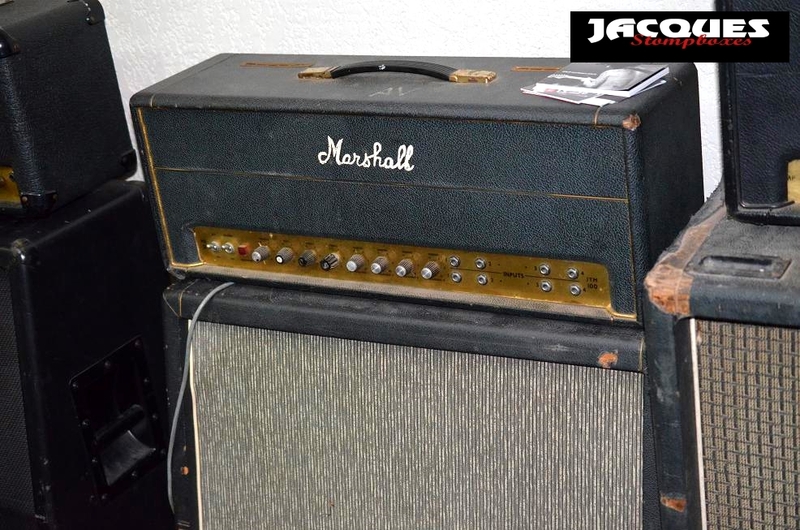 It also features the famous cloth-retainers , made of heat resistant coton and giving a real Lewis Caroll look to the amp chassis. 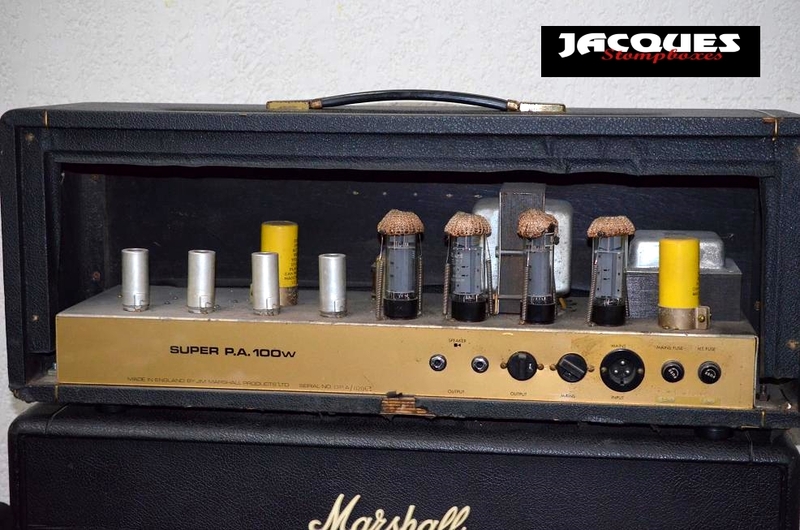 Spot the yellow capacitors and laydown transformer, making it a real plexi amp. The cloth retainers were left for sturdy steel to protect the expensive KT88 or 6550 while it may not have been a good idea to mix them like here. I suppose the strange small double circuit board on the left is a test point for bias or a bug killer.